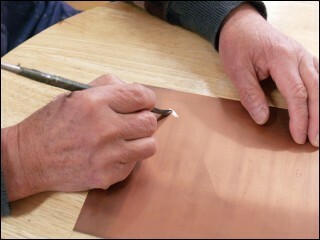 The engraving process is the first step in preparation of the plate that will be used to create the master plate which is the "negative" of the actual printed artwork. This master plate will be used to print the "positive" witch is the actual artwork. Since this is a long a tedious process, he prefer to do it only two hours a day, in this way he is sure to put the maximum attention in the preparation of the plate. Usually it takes anywhere between 1 day and two monts to prepare a plate (depending upon the size the plate). 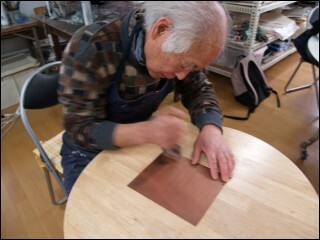 During this stage of the creation process, Toru Iwaya prefers to listen to classic music and old Japanese, French songs and argentina's Tango (depending on the mood), playing from a stereo nearby in the background. Once the plate is completed, he starts the actual creation process by removing the pits that correspond to the white, or different shades of gray he wants to accomplish. Since it's very very difficult to reinsert the pits once they are removes, there is a very little margin for errors. Once the pits are removed, he then used the "burnisher" to smooth the area where the pits are removed. One plate can only be used to print in one color, if more than one color is required in the artwork, Toru Iwaya prepares a second, third and sometimes even a fourth plate that has just the pits he wants to color. The main plate is called master, and it's always printed black, the others are printed with the required color. If more than one color is used in the same plate, it's almost always placed in separate areas of the plate. The plates has to match perfectly, during the creation and printing process Toru Iwaya is especially skilled in this technique.